The philosophy of the LABBB I.D.E.A.L. Program is that every child has the right to an individualized education that will help them learn to the best of their ability no matter what their disability. We serve a variety of disabled children ages 5-11 in grades Kindergarten through Five. The children’s special needs conditions include, but are not limited to cerebral palsy, visually impairment, seizure disorders and neurological impairments. All of our children have some degree of motor and language impairment. Housed in the Francis Wyman Elementary School in Burlington our program is an eleven month program. That includes the ten school months as well as a camp program that runs half days during the month of July. We offer two small classes no larger then six students per class. Each classroom is staffed with a special education teacher, a nurse and at least one assistant. We offer services in the area of Physical Therapy, Occupation Therapy, Speech & Language, and Social Services. Using assistive technology the children work on basic communication skills, including augmentative alternative means of communication, gross and fine motor skills cognitive skills and early self-care skills. All of our children work on individual education plans where they develop cognitive skills at there own pace. We are a small specialized program with the benefits of being involved in a large public school. We follow an inclusion model whenever it is appropriate. At any given time you might see students in a school play, participating in regular recess, or studying the subject of wind while flying kites with a regular education class. Weekly we join our voices together in the “Big Sing” group along with other special education classrooms in our school. The children also partake in community experience programs whenever possible, such as bowling in Woburn, Bowlarama and school curriculum related fieldtrips. On January 30, LABBB Collaborative held a “Team Meeting Workshop” for LABBB administrative staff and administrative staff who work in the LABBB districts to work on developing an I.E.P. protocol for Team meetings. The goal of this workshop was to discuss facilitation models, laws and regulations under I.D.E.A. and best practices that will promote more efficient and productive I.E.P. meetings. Sally Smith, the LABBB/EDCO/CASE special education professional development coordinator, facilitated this meeting. Sally was the former Special Education Director in Belmont. All participants who attended this meeting have a significant amount of expertise chairing I.E.P. meetings, therefore, the discussions was very interactive. Furthermore, this was also a learning opportunity because of the in depth knowledge of special education that the group has and we appreciated all the comments and suggestions that were offered. A Team meeting protocol document will be created that will outline all components of a Team meeting. The objective is for all staff to understand the expectations of the I.E.P. process and increase communication among all team members. Training for staff who attend I.E.P. meetings will also be conducted when the final protocol is completed. The LABBB Photography club was a vision of Theresa Leblanc,Vocational counselor, and Betsy Kidder, Occupational Therapist in the LABBB Collaborative. For those of you who have attended the LABBB photography club exhibits you have experienced a new feature of our program that is very unique! Three years ago Theresa and Betsy Kidder, LABBB Occupational therapist, offered their first photography course for students in the LABBB Program. This has been a project that has received a significant amount of recognition and the student photographs have been on display at Wilsons Farms, Lexington High School, and Citibank. Furthermore, Hewlett Packard has also contacted the club to inquire about donating digital camera’s, a school committee member has been interested in having the students work displayed in the community and the photography club has had articles in the Lexington Minuteman, Boston Globe and the Council for Exceptional Children on-line magazine. The photography clubs “unveiling” exhibits have been exciting events. This is an evening event where the students photographs are shown to the public. The attendees have included: current LABBB students, family, family friends and relatives, LABBB staff , building staff among many others. Below are some links if you would like to look at more pictures that have been taken by the students. They are remarkable pieces of work. Not only have we been impressed by the students ability to create these works of art, but it has also been a positive social experience for all our students. To view more pictures and articles about the LABBB photography club, please visit the sites below. The Boston Globe article was also featured in the Council on Exceptional Children C.E.C. online magazine and was called, “Young Artists use Photography to view the World.” The link is below. Go to the section on Eye on Exceptionalities. LABBB Collaborative, in partnership with Minuteman Regional Vocational High School, is pleased to announce an exciting new program, Career Directions, providing vocational and academic opportunities for students of the Collaborative. Career Directions, located at Minuteman High School in Lexington, functions cooperatively with other LABBB programs located at Minuteman. The staff of Career Directions and LABBB Vocational Training Program welcome you to our blog. Pictured L to R: Brian Walsh, Teacher; Ken Moeller, Assistant; Steve Thompson, Teacher; Dianne Costello, Program Coordinator; Brenda Wells, Assistant. The new LABBB Brochure has finally arrived. Below is a picture of the front cover. It is a 20 page booklet that has descriptions of all the LABBB Programs. I want to thank everyone who worked on this project. It was a long process and much more difficult than anticipated, but we have a final product that is very impressive. As I stated in my letter, we will update this every year and keep it current. We are also updating the website and the plan is to keep it consistent with the colors, and format of this new brochure. Click here for full Brochure: Click here to view brochure. If you have any feedback on changes that could be made for next year we welcome your suggestions. This was a great start to the project and we look forward to continually improving each year! Marisol O’Brien was a student in our I.D.E.A.L. Program in Burlington for the past 3 years. I wanted to share with you the article that was in the Boston Globe on December 23, 2008. The LABBB collaborative, especially the staff in our IDEAL Program, appreciate all the support we have received from the Francis Wyman Elementary school community. 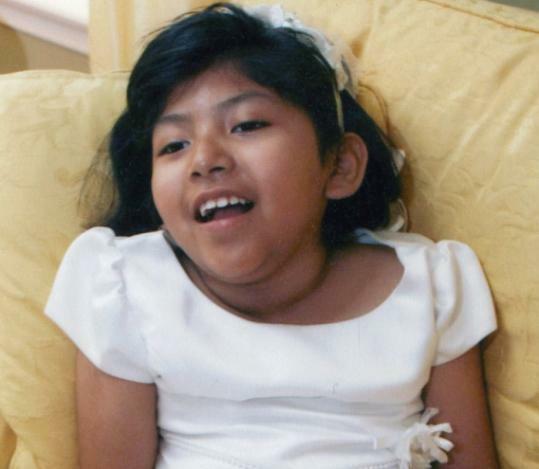 Marisol Liliana O’Brien, 8, seen in her First Communion dress, died Saturday in her home. As if she knew her time alive would be too brief, Marisol Liliana O’Brien seemed to keep her eyes open day and night. So, too, was Marisol, despite spending most of her life afflicted by a form of leukodystrophy, a degenerative disorder that affects the tissue that controls how signals are sent throughout the brain. Nevertheless, her smile turned strangers into friends, even as her illness brought family members closer to their faith and tightened the bonds of a community. Marisol was 8 when she died Saturday in her Lexington home, her family gathered around. Her smile, joyful and inviting, breathed warmth into encounters often fraught with silence. Before the doctors, tests, and painful decline in Marisol’s health, the O’Brien family felt close to perfect, her father said, and she was the presence who completed the picture. Thomas O’Brien, a former director of the Boston Redevelopment Authority, and his wife, the former Patricia Joyce, adopted all four of their children: first Lucas from Colombia; then Nina from Guatemala; and Tomas from Ecuador. A trip to adopt Marisol meant traveling familiar ground. When he arrived at Logan International Airport with Marisol eight years ago this month, “the kids were so excited, each of them hugging her and holding her,” he said. The dancing began to slow before she turned 3, when she starting having trouble walking. Many doctor visits later, she was diagnosed with leukodystrophy, a disorder her father called cruel. Physical abilities disappear, replaced on some nights by seizures and muscle spasms. Marisol, he said, brought the O’Briens closer to their spiritual family at Sacred Heart Church in Lexington, where a funeral Mass will be said tomorrow at 10 a.m. Parishioners sometimes held 24-hour prayer services, staying up with the family. Along with her parents, two brothers, and sister, Marisol leaves her grandparents, Gerald Joyce of Milton, and John and Anne O’Brien of Harwich. Welcome to the LABBB Primary Development Program! Our classroom is designed for kindergarten through grade two learners with autism spectrum disorders as well as for those learners who can benefit from the program’s instructional approaches and environment. The program has a high teacher-to-student ratio (currently, four core staff and six learners), with ongoing speech/language, occupational, and physical therapy services delivered by LABBB therapists. Additional support, both direct and consultative, is provided by a LABBB behaviorist and a LABBB reading specialist. Based in the Memorial Elementary School in the K-2 wing, our learners also have daily opportunities to participate in activities with their grade-level peers. Highly individualized instructional programs based on the principles of applied behavior analysis (ABA). We employ aspects of evidence-based ABA methodologies, which at this time includes Verbal Behavior and TEAACH. Pervasive use of visual cues and multi-modal communication tools, such as individual schedules, topic boards, social stories, play scripts, and static and dynamic display devices. “Hands on” individual and small group learning opportunities to acquire new skills with ongoing generalization of those skills in the general education classroom as well as larger school and community environments. Incorporation of a sensory diet into the daily curriculum. To the extent possible, direct and incidental instruction in natural settings, for example, learning playground skills (both social and gross motor) in the playground at recess alongside peers. We believe that our learners are active, equal members of the school community and we strive to ensure that they are included in the general education classroom and school-wide events as much as they are comfortable and able. For some of our current learners, this mean daily participation in English language arts centers and “specials” (e.g., art, gym, and music) and for others, attending morning meeting and having snack, lunch, and recess with their peers. In the future, we hope to add a book buddies and “game day” to promote additional opportunities for social interaction. The LABBB Primary Development program embraces a collaborative, team approach, that includes not only core staff, but also our learners’ parents and families, Memorial School staff, and LABBB administrators and support staff.